What a week. I feel as though it was two or three weeks packed into one, and I do not think that I have ever been so exhausted, but I saw so many beautiful things…… it was all our madness to be completely honest, but hey, we do madness here. 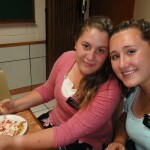 Monday night we had a slumber party with the sister missionaries working in Los Naranjos, Hermana Wright and Hermana Guzman. Why? Well on Tuesday we had to wake up super super early to take a super long and hot bus ride to San Salvador. 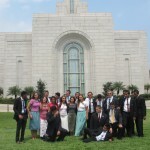 TEMPLE TRIP! Me encanta ver al tempo! But really, it was such an amazing experience. I did not have any profound revelations, or visions, but it was such a beautiful experience. 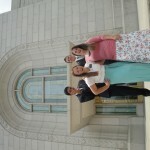 I took my patriarchal blessing with me and read it in the temple for the first time. I felt so much love and learned a little more about who I am. It made me feel a little more important. The next time you go to the temple, take your Patriarchal Blessing! It was a crazy bus ride and extremely hot, but totally worth it. 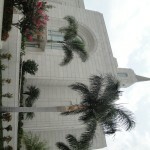 I love the temple. This week we also had to do a ton of exchanges with the sisters and I had the chance to go and work with Hermana Wright in Los Naranjos (she is with me in the photo). My companion cheerfully volunteered to stay with the poor Hermana Guzman who is a little sick, and I took advantage of the opportunity to work with Hermana Wright. I love her so much! 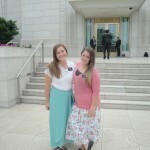 She is finishing the mission in this change, and I am so sad that she is leaving, but she is going to do wonderful things! I learned so many things in exchanges and I had such a great day. 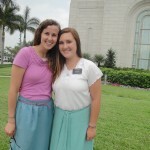 She is so consecrated and embodies a truly successful missionary. On Friday we went straight from the office in Santa Ana to Ataco again (it was almost three hours in a bus that was has hot as infierno, not cool) and I was able to work with Hermana Izcano and Hermana Gutierrez. I love them so much! 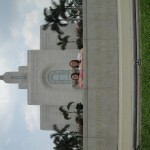 Hermana Gutierrez came with me in the mission, and Hermana Izcano is my sister! 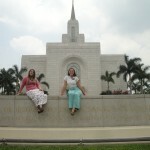 Well, she was also trained by Hermana Judd. They are so amazing and they taught me a lot! They are both such great examples of consecration and love. We had some amazing lessons as well that showed me they take advantage of receiving revelation in their companionship study. At one point in a lesson, a rather disgruntled mother walked in as we were singing “I am a child of God” and told us to leave. It was the first time in my mission that I had been truly “kicked out” of a house, and it was a little rough, but the sisters just brushed it off and kept visiting with smiles as if nothing had happened. It taught me a lot. I love them so much. It is sweet to be able to work with the other sisters…. but it is really exhausting at the same time. Well, that is the sum of this week. A lot of traveling in overheated busses but a lot of happiness and a lot of miracles. I love the mission! Be happy, be awesome, and be epic! Oh, and May the 4th be with you!